Take 42% off the entire book. Just enter code slelger into the discount code box at checkout at manning.com. Companies everywhere are moving everyday business processes over to the cloud, and AI is increasingly being given the reins in these tasks. As this massive digital transformation continues, the combination of serverless computing and AI promises to become the de facto standard for business-to-consumer platform development—and developers who can design, develop, implement, and maintain these systems will be in high demand! 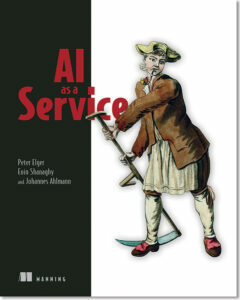 AI as a Service is a practical handbook to building and implementing serverless AI applications, without bogging you down with a lot of theory. 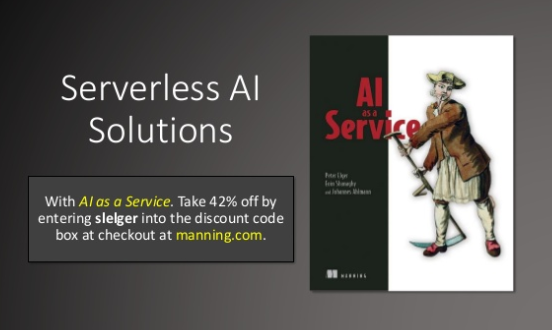 Instead, you’ll find easy-to-digest instruction and two complete hands-on serverless AI builds in this must-have guide!